Go home, movie. You’re drunk. 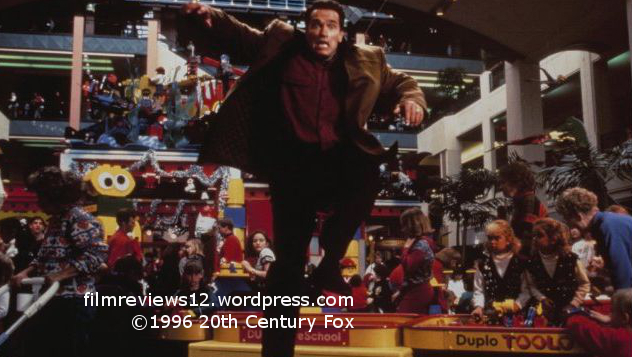 Jingle All the Way is a horrible movie about horrible people. And it tries so hard to do good. Maybe it wants to be a lesson based comedy about the commercialization of Christmas, except it’s not funny and no one learns a thing. Maybe it wants to be a straight-up satire about the commercialization of kids. That can’t be either, because the target audience (kids age 9 – 12) probably wouldn’t pick a lot of it up. All that can be practically displayed is that Jingle All the Way attempts to be an innocent family Christmas comedy, and fails spectacularly. Howard Langston (ARNOLD SCHWARZENEGGER) is a workaholic employee at a mattress factory. While everyone else is at the office Christmas party, he’s still locked up in his office, taking calls and filling orders. This doesn’t sit well with his wife Liz (RITA WILSON) and son Jimmy (JAKE LLOYD), for he constantly misses family events. They’re often videotaped by Ted (PHIL HARTMAN), a snarky neighbor that appears to be superior to Howard in just about every way. Howard attempts to make up for his absence in his son’s life by buying the one thing Jimmy most wants for Christmas, which is an action figure based on a popular TV show called “TurboMan”. There is one problem – it’s Christmas Eve, and the item has been selling out in every toy store around. “TurboMan’s only the hottest selling Christmas toy ever”, one irritating toy store employee (CHRIS PARNELL) says. Now, our protagonist must hunt for the in demand gift, all while battling an irate mailman (SINBAD) on a similar mission. A Christmas film should not be annoying in its own existence. Yet this one is. It is tonally inconsistent, shifting from a grounded family film at the start of its 89 minute runtime to the last act, where any sense of coherency combusts and becomes a film chock-full of increasingly unrealistic scenarios and plot points, to the point where one has to wonder if this is a fantasy movie. It’s as if writer Randy Kornfield suddenly quit writing, smashed his computer to bits, and fed the work he had so far through one of those story writing machines. We have sequences of Arnold running into a radio station and screaming the answers to question in order to win a TurboMan doll immediately followed by Sinbad pulling a box out of his mail satchel and telling a group of policemen that he has a bomb. The screenplay is so jumpy it’s mildly upsetting. Don’t get me wrong, there are some genuinely funny moments, but they disappear under the mounds and mounds of evidence to the contrary. Schwarzenegger’s performance is pretty flat, but it’s not much of a surprise – the work that brought him to stardom did not focus on or require dramatic skills. The late Phil Hartman is suitably sleazy as Ted, the shameless overachiever, continually flirting with Liz. Jake Lloyd delivers an alright, but not noteworthy performance as Jimmy. Sinbad is given an insane off-the-wall character, and he dutifully handles it. It’s nothing to write home about, though. 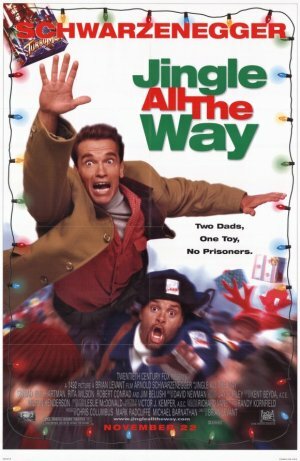 Jingle all the Way is an awful thing to do to a beloved holiday. I’d rather not call it a Christmas film, for that is what I call many good movies, too. Whether clever satire or just an attempt at light comedy, there is one key question that I don’t recall the script fully answering: Liz apparently reminded her husband two weeks before about Jimmy’s obsession with the action figure. It is implied that everyone is used to Howard’s work-grounded life. With all of that in mind, why didn’t Liz or any other relative buy the toy?